How would Captain Kirk handle Star Sapphire? How would Spock take to Kilowog's ballistic style of training? Klingon's inducted into the Sinestro Corps? UHura as a Star Sapphire? Mogo ruled by Kahn? 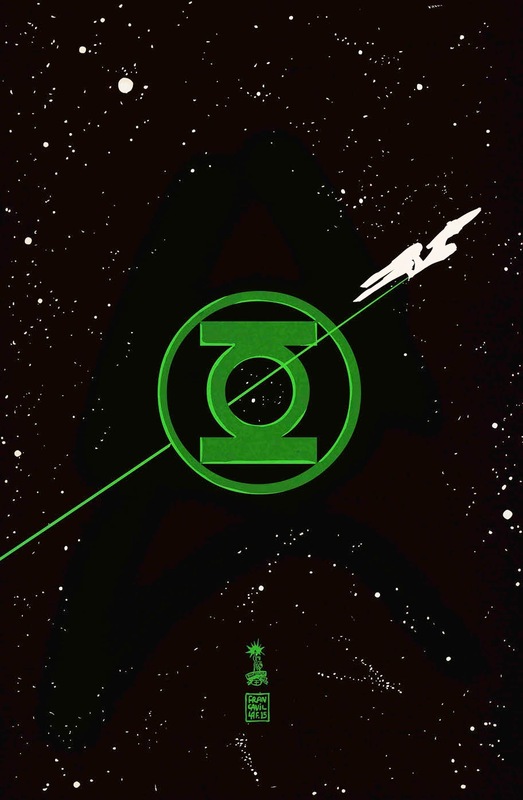 These are but a few of the beautiful possibilities now actually possible with DC Comics / IDW's upcoming 6-part crossover mini series Star Trek / Green Lantern: The Spectrum War. Blasting off to test willpower where no man's gone before this July, the mini series will be written by Mike Johnson, with art by Angel Hernández. Now I collected the two publishers' Legion of Super-Heroes / Star Trek a while back, and if this is anything like that epic, it will be a true timeless encounter that shows just how rich both cult concepts are. Says the press release: "Set in Star Trek’s 23rd Century, the balance of the universe will be tested when the Green Lantern Corps' Power Rings come into the possession of certain Star Trek characters while a dark and powerful evil looms around every corner. Only the combined power of the Green Lantern Corps and the Federation stand any chance of stopping those who worship evil's might." Now if they only visited the DC universe after. I'm sure Krypton, Rann, Thanagar, and Apokolips could do with a few new visitors! What will you be hoping for most? I'll probably be in the extreme minority that sees this and goes meh. Not that the premise and concept doesn't hold and should hold, some interest, I'm just thinking DC did this because of Disney/Marvel reacquring the SW franchise. I was all for it- until I found out it was the new-movie-Trek versions of the characters. Like Dale, I'ma have to pass on this too. Two passes in one post, man it seems like I'm losing my touch!